Another successful AHL All Star Classic is in the books. This year, the venue was Allentown, home of the Phantoms. Albany looked to be well represented, with John Quenneville, Joe Blandisi, and Vojtech Mozik selected to represent the North Division. Then…Sunday morning all three were mysteriously pulled from the event. A highly contagious virus had struck a few members of the roster (i.e. Reece Scarlett, Blake Pietila), and due to risk of possible exposure, the team and league determined it was best everyone stayed home to recover. But for me, even though I was now left without a team in the fight…the show must go on. 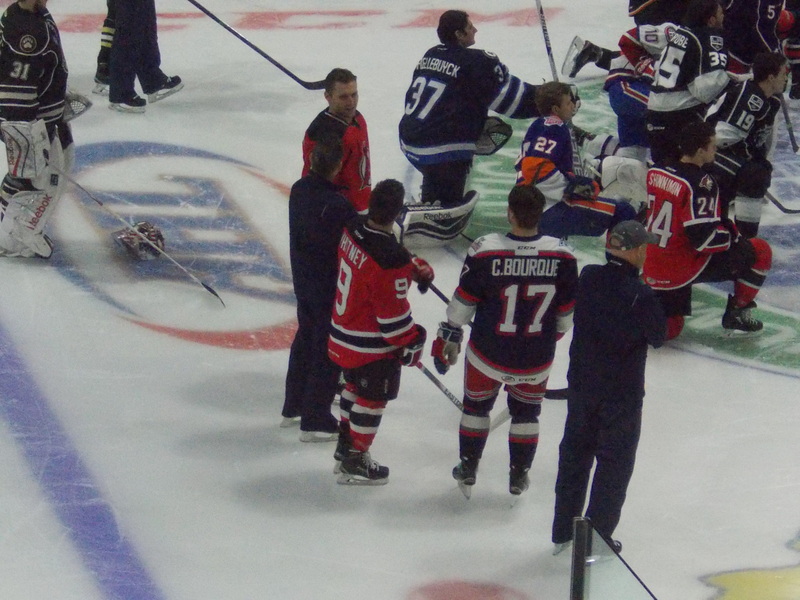 First, both conferences battled in the Skills Competition. Leading off, the Puck Control Relay: the West would win the first three heats, with former Devil Matt Lorito (now with Grand Rapids) part of the first winning team. The East would win the final individual round (Lehigh Valley’s Jordan Weal would be the winner). Second event, the Fastest Skater: This year’s event was record setting, as Bridgeport’s Devon Toews would become the second fastest ever in the event’s history, winning with a time of 13.478 seconds. All but one skater would finish at 13.8 or faster. The East picked up the individual point, while the West took home team honors for lowest average with 13.769 seconds. Third event, the Rapid Fire: Both teams would earn a point, as they tied with 23 saves each. Former River Rat Michael Leighton (now with Charlotte) and Rochester’s Linus Ullmark would each stop 8 shots in their respective rounds. Fourth event, the Hardest Shot: Another two points to the West, as Tucson’s Kyle Wood took home the individual title with 99.3 MPH. The West also grabbed team honors with an average shot of 98.1 MPH. Fifth event, Accuracy Shooting: No one went 4 for 4, but Cole Schneider of Rochester came the closest, getting 4 targets in 5 attempts. The East took the team honors, hitting 15 targets in 25 total attempts. Sixth event, Pass and Score: In the three on none round, the East would win 6-3 and take the overall competition lead. Troy Grosenick (San Jose) and Tristan Jarry (Wilkes-Barre/Scranton) were the only two goaltenders to stop all three attempts. The trio of former River Rat Chris Terry (now with St. John’s) and Utica teammates Alexandre Greiner and Jordan Subban scored all three of their goals against Cleveland’s Anton Forsberg. Seventh event, Breakaway Relay: All four West goaltenders–Grosenick, Jack Campbell (Ontario), Forsberg, and Leighton–would stop every shot they faced. On the East side, Ullmark would be the only goaltender to shut out his round. Five West skaters would pick up goals, giving the West the overall win. Ullmark would take home Top Goaltender honors, as he stopped 15 of 18 total shots faced. The Top Goaltender, Linus Ullmark (Rochester). Minus the sweet Minion mask. -Next year’s schedule will come out 5-6 weeks earlier than normal. Which means you can start making your plans in July instead of nearly having to wait till September! 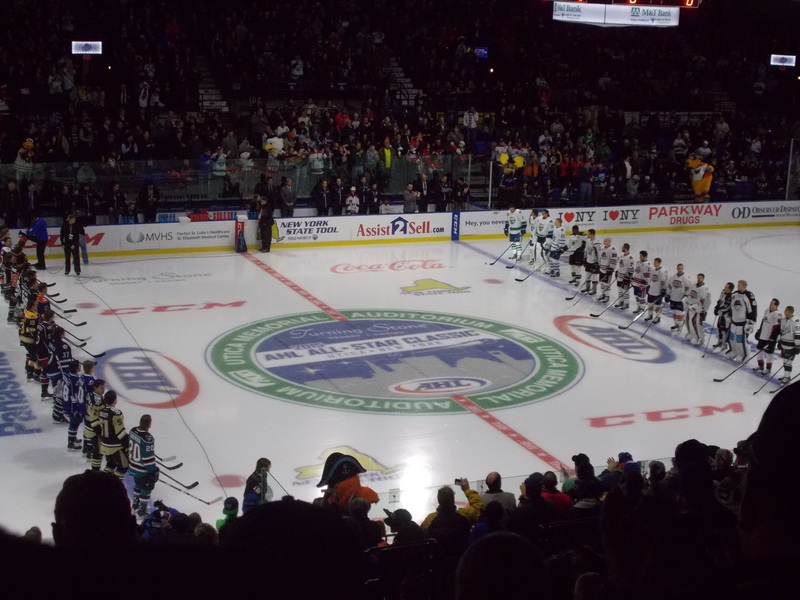 -With Las Vegas joining the NHL next season, talk of a 31st AHL team was brought up. It may not come to fruition until 2018-19 at the latest. Outside of the three North Division moves, everyone else appears to be staying put for the long haul. Realignment also appears to be on the radar for next season as well. -Later Monday morning, former River Rat Bryan Helmer was one of four men to be inducted into the AHL Hall of Fame. Everyone sporting #14 in honor of Craig Cunningham. Leading off the 3 on 3 tournament, the Atlantic took on the Central. The Atlantic would score both their goals during the first five minute half, as Mackenzie Weegar (Springfield) and Travis Boyd (Hershey) would score 36 seconds apart. Oliver Bjorkstrand (Cleveland) would break up the Atlantic shutout bid with 48 seconds left in the second half. Zane McIntyre (Providence) stopped 6 of 7 shots, while Leighton stopped 3 of 5. The other two divisions faced off in the second game…and this one was no contest. After both teams went back and forth during the first half, the North Division would explode for four goals in the second half. Justin Bailey (Rochester) scored twice in a 14 second span, while former Devil Matt Taormina (now with Syracuse) and Alexandre Grenier (Utica) added two assists each. Ullmark would stop 5 of 6 shots in the first half, while Charlie Lindgren (St. John’s) took over in the second half and stopped just one of three. Campbell had a rough go in the second half, stopping 5 of 9 North shots. Unlike the previous round, this was a low scoring affair. Casey Bailey (Binghamton) would put the North ahead late in the first half. Alex Tuch (Iowa) would tie things up early in the second half. With the first tie of the evening, it would be settled by the shootout. Kenny Agostino (Chicago) and Spencer Abbott (Rockford) would each score, while Anton Forsberg (Cleveland) would stop 2 of 3 North shooters for the win. He stopped 11 of 12 shots before that. Ullmark would stop all 4 shots faced in the first half, then Lindgren would stop 6 of 7 in the second half. Another blowout performance against the Pacific in this round. Hometown boys T.J. Brennan and Jordan Weal would score 1:12 apart for a 2-0 start, then Daniel O’Regan (San Jose) would cut the lead in half. But the Pennsylvania connection would put the game away for the Atlantic…Hershey teammates Chris Bourque and Boyd would score :45 apart, then the third Phantom representative, Taylor Leier, would make the hometown crowd happy with two goals in the second half. The Pacific was held shotless in the second half, while Campbell and Troy Grosenick (San Jose) combined for 6 saves on 12 shots overall. Anyway…the Central would get off to a very quick start in this round, taking a 3-0 lead within the first minute of the contest. Lorito, Agostino, and Tuch would all score within :43. Christian Fischer (Tucson) would get the Pacific on the board, only to see Oliver Bjorkstand (Cleveland) answer with a goal late. In the second half, Lorito would pick up his second of the game for a 5-1 advantage. Wood and O’Regan would pick up goals, but it was too little too late. Leighton and Forsberg combined to stop 9 of 12 shots. Grosenick and Campbell would only save 2 of 7. With the win, the Central clinched a spot in the championship game. So who would be taking on the Central for the title? It would be an offensive struggle for the North in this one, as they could not get a goal past Tristan Jarry (Wilkes-Barre/Scranton) in the first half. Nicklas Jensen (Hartford) would get the Atlantic on the board. Zane McIntyre (Providence) would take over in the second half, and he too would keep the North in check. Leier would add an empty netter late to send the Atlantic to the championship game. Ullmark and Lindgren would combine for 11 saves on 12 shots. One from the East, one from the West. But only one division can be the winner. And both teams battled to a scoreless tie through regulation, combining for just 5 shots in the 6:00 round. It would go down to a sudden death shootout…Weal, Agostino, Bourque, Abbott, Boyd, Bjorkstrand, and Leier were all unsuccessful. But it would be the former Devil, Lorito, who would score on McIntyre in the fourth round, clinching the Challenge for the Central Division for the second year in a row. Leier would take home MVP honors, scoring 3 goals on the night. As for my experience: as always, everything was wonderful, despite the fact I had no one show up. (For those of you who continue to think it’s New Jersey screwing us…you’re wrong. I have confirmation that it was indeed illness. I get it, you’re ticked, but for the love of all things holy STOP IT.) It was my first visit to Allentown and…if you can make the trip to the PPL Center, absolutely do it. The building is awesome…and not just because there’s a Tim Hortons attached to it (give me all the Timbits!). Sight lines were great from nearly all angles, the atmosphere was energetic…no complaints here. If the 2018 version stays in the east and I can drive there…I may make the trip for the fourth year in a row. For more photos check out my Flickr album! Now the Farewell tour begins, starting Thursday. Sometimes, you need just a little more time to get what you want. That was the case for the Devils this week, as they inched closer to returning to first place in the North Division with a pair of overtime victories…and nearly had a chance at a third. It was a battle of 1 vs. 2 in the North Division, as the first place Crunch made their first visit of the season to the Capital Region after taking the first two matchups of the series on their home ice. Ryan Kujawinski’s second goal of the season 6:04 into the contest would put the Devils ahead early 1-0. Then, for awhile, it became a goaltenders duel between Ken Appleby and Adam Wilcox, as the two combined for 33 saves on 34 shots over the first forty minutes of the contest. Vojtech Mozik looked to pick up an insurance goal on the power play 7 minutes into the third for a 2-0 Devil lead. But, the Crunch were not about ready to throw in the towel just yet. On a scrum in front of Appleby’s net, a questionable non-goaltender interference call would lead to Syracuse cutting the lead in half on Yanni Gourde’s 13th goal of the season. Barely two and a half minutes after that…we would be tied at 2, thanks to a Tanner Richard goal. For the third time in the last four games, the Devils found themselves needing overtime to settle things…and just 1:17 into the extra frame, Kevin Rooney would send everyone home happy with the game winner, his 8th of the season. Appleby would end up with 29 saves on 31 shots, picking up his third straight win, fourth in his last five starts, and 11th of the season. Ben Sexton continued his hot play of late, contributing two assists, while three other Devils had one helper each. Power Play: 1 for 3. Penalty Kill: 4 for 4. Penalty Minutes: 8. Shots on Goal: 26. Shots Allowed: 31. 3 Stars: 1. Kevin Rooney; 2. Ken Appleby; 3. Tanner Richard. It was then off to a very snowy Newfoundland, as the Devils kicked off a two game set against the IceCaps, with the first game having to be pushed back due to a snowstorm in the area. And before most of a sparse crowd were likely even in their seats, Vojtech Mozik was putting the visitors on the board 18 seconds after puck drop with his 5th goal of the season. Jeremy Gregoire would tie things up midway through the opening period with his 6th goal. Then while the Devils were on their second power play, a turnover would be stolen by Chris Terry, who broke in alone and scored for a 2-1 St. John’s lead. Ryan Kujawinski would re-tie the contest late in the second period with his 3rd goal. In the third, despite a 12-8 shot advantage for the Devils, it would be the home team pulling it out in the end. On a scramble in front of Ken Appleby’s net, Michael McCarron would score with 5:09 remaining in regulation to put St. John’s ahead by one. Max Friberg would add the empty netter late for the nail in the coffin. Appleby played well despite the loss, only facing 18 shots and stopping 15. Nick Lappin and Josh Jacobs would pick up the only helpers. The game also marked the returns of both Joe Blandisi and John Quenneville to the lineup. Power Play: 0 for 2. Penalty Kill: 4 for 4. Penalty Minutes: 12. Shots on Goal: 28. Shots Allowed: 19. 3 Stars: 1. Chris Terry; 2. Charlie Lindgren; 3. Brian Gibbons. About 18 hours after the final whistle, both teams would meet for the rematch, with the only difference being former Devil Yann Danis in net for the home team. Much like the night before, it would be the Devils getting on the board first, courtesy of a power play goal by Jacob MacDonald, his second during his PTO stint. Also like the night before, the IceCaps would find their way onto the scoresheet courtesy of a turnover…in this case, Charles Hudon would pick up his 12th goal with less than a minute remaining in the first for a 1-1 contest. Then both Danis and Ken Appleby would go into lockdown, stopping a combined 33 shots (Danis 19, Appleby 14) over the final 40 minutes of regulation. For the fourth time in two weeks, Albany would go to overtime, and for the third time in two weeks, they would get the extra point. Joe Blandisi would score the game winner 1:18 in for the victory. Appleby would stop 21 of 22 shots in the win. Nick Lappin, John Quenneville, and Carter Camper would have one assist each. Power Play: 1 for 5. Penalty Kill: 2 for 2. Penalty Minutes: 6. Shots on Goal: 32. Shots Allowed: 22. 3 Stars: 1. Joe Blandisi; 2. Yann Danis; 3. Brett Lernout. There was one constant in all three games this week: the man between the pipes. You may have noticed that Ken Appleby has started the last 4 games, winning three. He leads all AHL rookies with a 1.89 goals against average and his .927 save percentage ranks fourth among all AHL netminders. Have the Devils found a new #1 goaltender? We shall see. 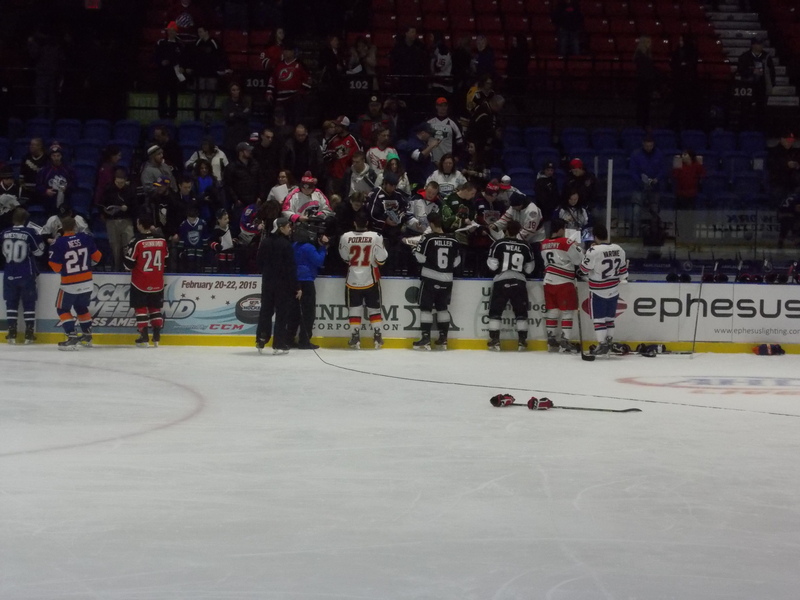 It was All Star week in Glens Falls, as the full Thunder roster was set to face off against a team of ECHL All Stars. But before that…Adirondack would drop a 5-3 decision to Manchester Monday afternoon at home. On Wednesday night, the Thunder would lose 8-7 to the league All-Star crop, but did pick up two wins in the mid game Skills Competition: the team of Greg Wolfe, Peter MacArthur, Brian Ward, and Dana Fraser would win the Puck Control Relay, and Stepan Falkovsky would win Hardest Shot at 99 MPH. Ward would pick up a goal during the second half of the game (the game was played in two halves with the skills in the middle), and Brandon Baddock would finally return to the lineup after being out since early December, picking up an assist in the first half. The Thunder would return to their regular schedule on Friday in Reading, losing 2-1 in overtime. They managed to salvage their week with a 7-4 drubbing of Norfolk in Virginia on Saturday. Wolfe would score once and assist on two others, Ward added two helpers, and Baddock even added an assist. Coming up this week: it’s a busy one, as the Thunder will have a three game homestand, starting on Tuesday against Reading. They face the same Royals on Friday night, then host Elmira on Saturday. They will finish out January on the road Sunday afternoon against the Jackals. It’s a relatively easy week for the Devils leading up to the All Star break. They will take on Rochester in a home and home set, starting Friday night on the road before returning home Saturday afternoon. While everyone else was watching John Scott rub it in the NHL’s face in Nashville, the American Hockey League had their own All Star events to tend to. And for the second straight year, I was able to make the trip…hey, it’s just a 2 hour ride west down the Thruway, you can’t pass that up. And it was a very interesting and fun time, as a new format was introduced along with the traditional skills (no Jagr impressions or little kids though). To get things started, Sunday night the All Stars competed in the annual skills competition. First, the Puck Control Relay…where the East dominated the team competition (Mike Sislo was part of the winning second heat) and split the individual heat (the middle round was won by the West Youth Star selections). Second round saw the Fastest Skater contest, where Stockton’s Derek Grant took home the individual title with a time of 14.307 seconds. The West also took home the fastest average time award. In the Rapid Fire round, the West won out again, stopping 28 shots while the East managed 24 saves. Yann Danis had 5 of those in his round. The East would finally get back in the win column during the Hardest Shot round, as Hartford’s Ryan Graves won the individual title with a 103.4 mph shot. St. John’s Morgan Ellis and Bakersfield’s Brad Hunt were the only other players to break triple digits. All set for Accuracy Shooting! In the Accuracy Shooting round, Chicago’s Pat Cannone took home the individual title with 4 hits in 5 shots. But the East won team honors after hitting the targets 18 times in 34 attempts. Both conferences split the Pass and Score competition, as Yann Danis stopped 2 of 3 shots faced during round 3. Mike Sislo faced off against Ontario’s Peter Budaj in round 6. The final event was the Breakaway Relay…and it wasn’t the greatest round for Danis, as he allowed 4 of 6 shooters to score. Sislo did score on Budaj in his round, but the West would dominate 10-5. Manitoba’s Eric Comrie would take home the top goaltender award after stopping 17 of 19 shots faced. -First on the agenda: the annual State of the League address. Topics discussed included the imbalanced schedule between the 5 California teams and the rest of the league (still sticking to the plan, but at some point it could get to an even schedule for everyone); the ultimate goal of having 2 referees for every game (due to small pool of referees available it will take time, but the two referee system will be in place for every playoff game come spring); and playoff financing structure for teams (instead of the league receiving a percentage of ticket sales, each team will “purchase” playoff dates from the league, giving them more flexibility for selling and pricing tickets). Wrong Side of the Red Line has your full wrapup here. -Now for the games! A round robin 7 game tournament between all 4 divisions commenced, lasting 9:00 each (except for the final game of 6:00). Both teams would play 4 on 4 for the first half, then switch sides and play 3 on 3 for the second half. The final would be all 3 on 3 for 6 minutes, switching sides halfway through. In the opening round, it took nearly the entire game before the first goal was scored…then Toronto’s Josh Leivo would score with just 27 seconds remaining to clinch it for the North. Yann Danis and Syracuse’s Kristers Gudlevskis would split the shutout, with Danis picking up the win. He only needed to stop 3 shots in 4:30, while Gudlevskis stopped 4 shots. Morgan Ellis (St. John’s) picked up the lone assist. Mike Sislo managed one shot on goal. The second game was another defensive battle that saw some late dramatics. Chicago’s Pat Cannone would put Central on the board with 3:30 left to go. Then just as time was about to expire, Hershey’s Chris Bourque would get one past Michael Leighton (Rockford) to tie it up, sending it to the shootout. Leighton would stop all three Atlantic shooters, while Portland’s Mike McKenna would give up one to Cannone, giving the Central the win. Leighton went the distance and stopped 4 of 5 shots before the shootout. 2 skaters on each side would have assists. The offense finally started picking up as the Central and North each played their second game. Yann Danis would draw the start and struggled a bit, giving up two goals in 4:30. Pat Cannone would score his second of the day 1:41 in, followed by Jake Dowell (Rockford) 36 seconds later. Dowell would strike again against Kristers Gudlevskis 5:03 in for a commanding 3-0 lead. But the North would get on the board with two goals in 31 seconds…Josh Leivo would score his second of the day, followed by Michael McCarron (St. John’s) to cut the lead to 3-2. But an empty netter by Ryan Hartman (Rockford) would clinch a second win for the Central. Manitoba’s Eric Comrie would go the distance in picking up the win, stopping 11 of 13 North shots. In another defensive battle, the Atlantic scored twice in the first 2:32 and never looked back. Bridgeport’s Alan Quine, a last minute replacement, would score on Bakersfield’s Laurent Brossoit 54 seconds into the contest. Seth Griffith (Providence) would double the lead with his first of the night. Sean Backman (Pacific) would break up the combined shutout bid with 1:30 left, but no more. Mike McKenna picked up the win with 3 saves, while Anthony Stolarz (Lehigh Valley) would follow up with 7 saves on 8 shots. Four different Atlantic skaters would add helpers. Finally, some offense! And it only took 12 seconds and a Derek Grant (Stockton) goal to get things started. Xavier Ouellet (Grand Rapids) and Nick Ritchie (San Diego) would trade goals 25 seconds apart for a 2-1 Pacific lead, then Mikko Rantanen (San Antonio) would extend the Pacific lead to 3-1. But just as the teams switched over to 3 on 3, the Central would rally. West Captain Jeff Hoggan (Grand Rapids) would cut the lead to 3-2, only to have Ritchie score his second 4o seconds later for a 4-2 Pacific advantage. Then Andre Benoit (Chicago) and Jake Dowell would score 2 minutes apart to tie the game up at 4. But with 4 seconds left, Grant would score his second and Brandon Montour (San Diego) would add an empty netter three seconds later to give the Pacific the win. T.J. Tynan (Lake Erie) would have two assists for the Central, while three Pacific skaters had two helpers each. An intradivisional battle to determine who was going to face the Central in the final round. Rob Schremp (Portland) would start the scoring 2:02 in against Yann Danis. After both sides switched to 3 on 3 play, Chris Bourque would pick up his second goal of the day for a 2-0 lead. The North would get on the board 25 seconds later thanks to a Mike Sislo goal, but that was as close as they would get. Alan Quine would score his second of the day for a 3-1 lead, then Schremp would score an empty netter to seal the Atlantic win. Danis stopped 3 of 4 shots, wrapping up a solid evening for him in net. The final battle for division supremacy in the AHL…and it was absolutely no contest. 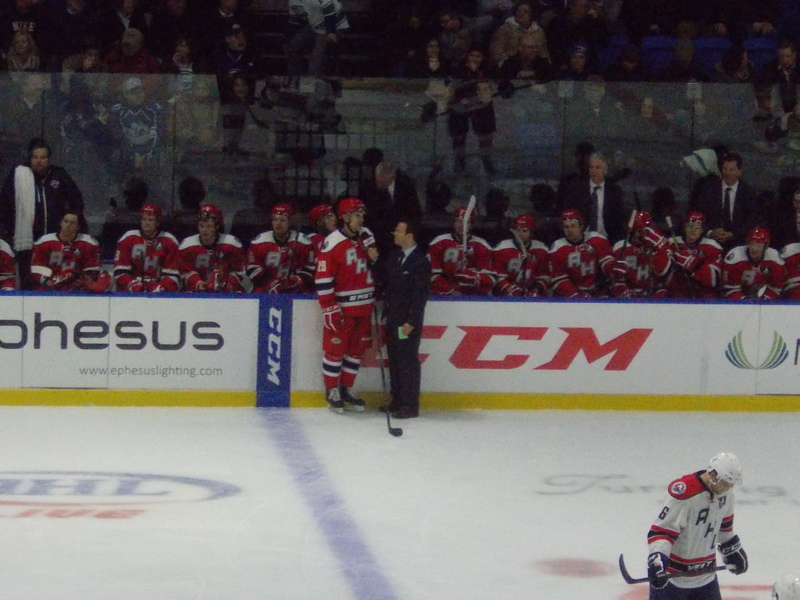 Jeff Hoggan would score 24 seconds in and the rout was on from there. Derek Ryan (Charlotte) and Pat Cannone would score 38 seconds apart for a 3-0 lead, then Xavier Ouellet would seal the title with an empty netter with 16 seconds remaining. Michael Leighton would go the distance and stop all 9 Atlantic shots. Frederick Gaudreau (Milwaukee) would pick up 3 assists. Although there were quite a few candidates for the night’s Most Valuable Player, Cannone would take home the honors. Thank you to the AHL, the Crunch, and everyone involved for a fun 2 days! It’s always a great time to meet up with friends from around the league and interact with mascots I never get to see (I’m looking at you, Western Conference). The Devils begin the first full week of 2016 with a 20-8-3-0 record, good for 43 points and a .694 percentage. They remain in second place in the North Division, 13 points behind first place Toronto. Injury update: All should be available for the weekend with the exception of Blake Coleman (shoulder) and Max Novak (hand). Congrats to Mike Sislo (1st) and Yann Danis (3rd) on being named to represent the Eastern Conference/North Division at the AHL All-Star Classic! Full rosters can be found here. Other Devil/River Rat notables named? Joe Whitney (Bridgeport/Atlantic), Matt Taormina & Mike Angelidis (Syracuse/North), and Michael Leighton (Rockford/Central). Former Devils captain Jay Leach will be coaching the Atlantic Division group, representing Wilkes-Barre/Scranton. BREAKING: New Jersey’s morning skate had quite a few new faces with injuries hitting the big club. Sislo was sent down, while Mike Cammalleri and Tuomo Ruutu were placed on IR. In their place? Paul Thompson, Jim O’Brien and Marc Andre Gragnani were summoned, with Thompson looking to make his NHL debut tonight. Notes: The game will mark the season debut for former first round draft pick Jonathan Drouin, reassigned to Syracuse by Tampa Bay on Saturday; former River Rat and Crunch captain Mike Angelidis was named one of the playing captains for the AHL All Star Classic on Tuesday; Syracuse is coming off a sweep at the hands of the Marlies last weekend, including an overtime loss and overcoming a 0 shot second period in Sunday’s game; the Crunch are also kicking off a 3 in 3 weekend, returning home on Saturday to host Hershey before traveling to Rochester Sunday afternoon. Notes: The Phantoms are coming off a split with Portland in Maine last weekend; forward Sam Gagner, loaned to Lehigh Valley by the Flyers on December 30th after not being claimed on waivers, has one assist in 3 games; Petr Straka leads the AHL in goals; this is the lone road game for a 3 in 3 weekend for Lehigh Valley, as they host Wilkes-Barre on Friday night and Binghamton Sunday afternoon; Anthony Stolarz and Nick Cousins are the All Star representatives for the Phantoms. Where: XL Center, Hartford, CT.
Notes: This game marks the last of a 5 game homestand for the Wolfpack, who are 0-2 after losing to Albany and Wilkes-Barre last weekend; like all Devils opponents this weekend, Hartford has a 3 in 3 weekend, hosting Springfield on Friday and Bridgeport on Saturday; second leading scorer Jayson Megna was recalled to the Rangers on Monday; the crease is a little more crowded with goaltender Cedrick Desjardins being recalled from a stint in Manchester on Wednesday; defenseman Ryan Graves is the lone Hartford All-Star representative. It’s been a relatively quiet month of May after a new general manager in New Jersey took the reins and after a sixth Albany season became official. But…things are starting to pick up a little bit, and today saw the first wave of draft pick signings. New Jersey announced earlier this afternoon that forwards Ryan Kujawinski and Blake Pietila have been signed to entry level contracts. Kujawinski was drafted in the 3rd round and 73rd overall in 2013 by the Devils, and split last season between Kingston and North Bay of the OHL, appearing in 61 games and posting 59 points (34 G, 25 A), while adding an additional 9 points (6 G, 3 A) in 15 playoff games with North Bay. Pietila, a 2011 5th round draft selection (129th overall), just completed a four year collegiate career at Michigan Tech. He tied a career high with 14 goals during his senior season in 40 games while serving as co-captain of the Huskies. -Manchester can finish off the Eastern Conference finals as early as tonight with a victory over Hartford, which would finish off a sweep of the Wolfpack. In the West, Utica and Grand Rapids are tied at 1, with the series shifting to Michigan beginning on Thursday. 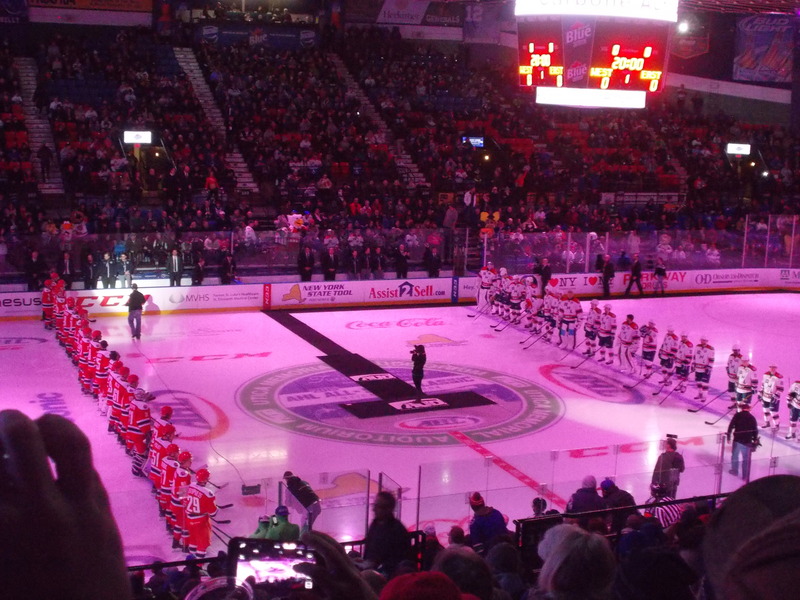 -The 2016 AHL All Star Classic is a go…with Syracuse hosting the event on January 31st and February 1st. Tickets for both the Skills Competition and the game officially went on sale earlier today. No, I did not order my ticket…yet. But all signs point to me making the trip west for the second straight event. Hard to believe, but the All Star weekend in Utica is over. This was my first time going to any All Star event at any level, and it was an awesome experience. Always fun to visit with friends from around the league and see players I never get to see live (translation: anyone in the Western Conference not a Comet or a Flame). Without further delay, let’s recap the last two days! Getting ready for the intros! The slate of events began on Sunday evening, as both teams took to the ice at The Aud for the Skills Competition. Both teams split the four rounds of the Puck Control Relay. Joe Whitney was part of the second heat, which the West won. In the second event for Fastest Skater, Manchester’s Colin Miller won the individual title with a time of 13.805 seconds. The West won the team average title at 13.9 seconds. The West goaltending dominated during the Rapid Fire competition, as goaltenders Richard Bachman (Oklahoma City), Jacob Markstrom (Utica) and Magnus Hellberg (Milwaukee) combined for 23 saves over 30 chances. In the final heat, Utica’s Bobby Sanguinetti owned St. John’s goaltender Connor Hellebuyck, burying 4 out of 5 shots on net to the delight of the hometown crowd. The East took the Hardest Shot round, thanks to a new AHL All Star record off the stick of Miller, who registered a shot of 105.5 MPH. His three shots on net all broke 103 easily. Paul Thompson took part in the Accuracy Shooting, getting all 4 targets on 8 attempts. Hartford’s Chris Bourque and Texas’s Maxime Fortunus tied with 4 targets out of 6 attempts. The West took the team point by hitting 14 targets out of 30 chances. In the Pass and Score Competition, Whitney and Thompson teamed up with Wilkes-Barre/Scranton’s Derrick Pouliot, but were unable to get the puck past Bachman. The East took the round by scoring 4 times over 6 heats. The East clinched the competition during the Breakaway Relay, scoring 5 goals over three rounds. Thompson and Whitney were shut out on their attempts. Hellebuyck and Manchester’s J.F. Berube stopped all 6 of their attempts to clinch the win. Colin Miller (Manchester) receiving his awards. Post Skills, everyone was signing by the boards. Nice touch. Before the actual game on Monday, the State of the League address took place at Turning Stone. Full audio from the Power Play Post Show can be found here. The Times Union has a brief summary of topics, such as the rumored Pacific Division and schedule adjustments. And now, for the actual game. Things got off to a good start for the East, as Portland’s Brendan Shinnimin got the first goal of the evening. But the West would rattle off three straight tallies, off the sticks of Rockford’s Mark McNeill, Milwaukee’s Brendan Leipsic, and Hamilton’s Charles Hudon. Shinnimin would add his second to get back to within one, only to have Chicago’s Ty Rattie restore the two goal lead as the period ended. But the star was the hometown goalie, Jacob Markstrom, as he stopped 16 of 18 shots, with some just point blank robbery. 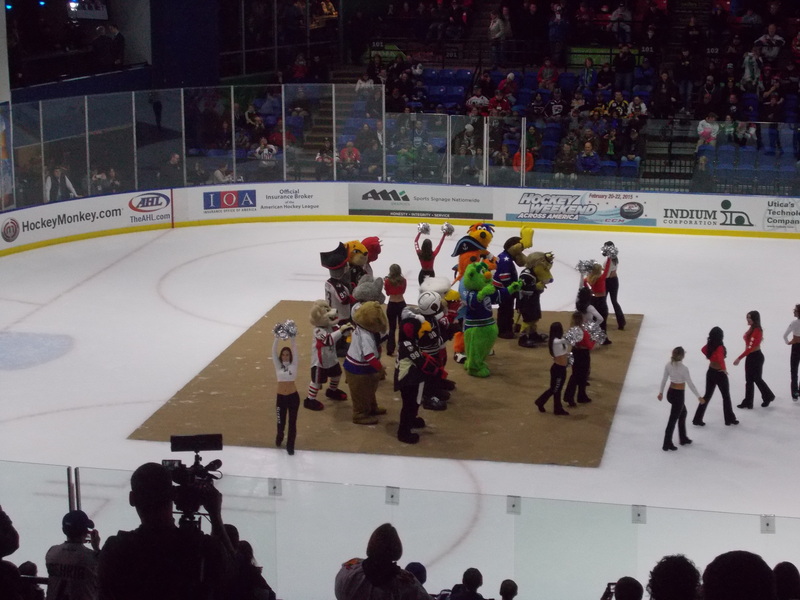 First intermission entertainment: mascot broomball! Second period was all about the offense, as both teams combined for 12 goals. The East would score the first four to take a 6-4 lead, as Springfield’s Austin Madaisky, Joe Whitney, Providence’s Alexander Khokhlachev, and Bourque all connected. But not to be outdone, the West would score six straight to go up 10-6. Hudon would get the hat trick, McNeill and Leipsic each had their second, and Rockford’s T.J. Brennan and Grand Rapids’ Teemu Pulkkinen scored one each. But the East wasn’t done quite yet, as Binghamton’s Shane Prince and Manchester’s Jordan Weal got on the board to make it a 2 goal West lead going into the third. Rochester’s Phil Varone was awarded a penalty shot late, but was denied. 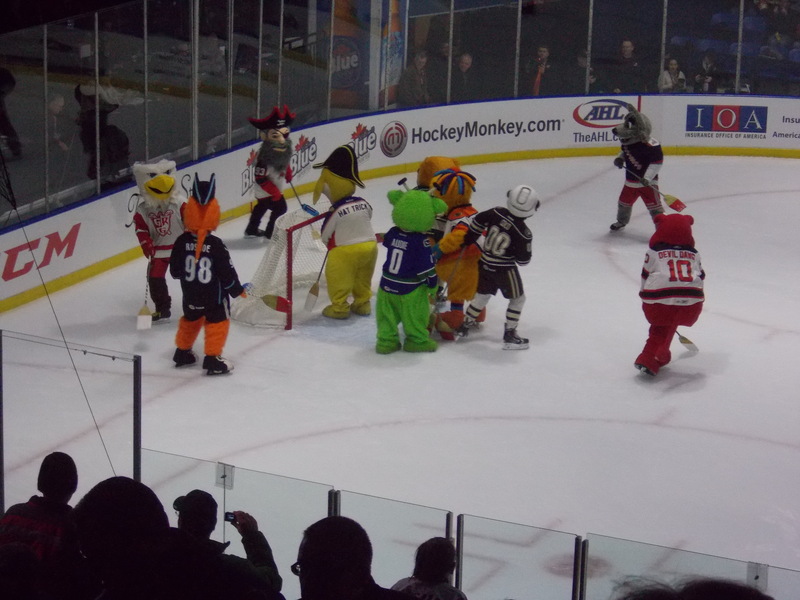 Second intermission: Mascot danceoff, aka the Tux invitational. In the third, Prince (with his second) and Adirondack’s Emile Poirier traded goals early on. Then, a second penalty shot was called, and Norfolk’s Chris Wagner connected to bring the East back to within one goal. But Leipsic and McNeill would each complete their hat tricks to make it a 13-10 contest. The other Adirondack representative, Drew Shore, would score the 14th goal for the West. Prince would complete the hat trick late in the period and Syracuse’s Jonathan Marchessault would get the final goal to finish off a very offensive game (but aren’t all All Star games like that?). The East outshot the West by an astonishing 59-40 margin. 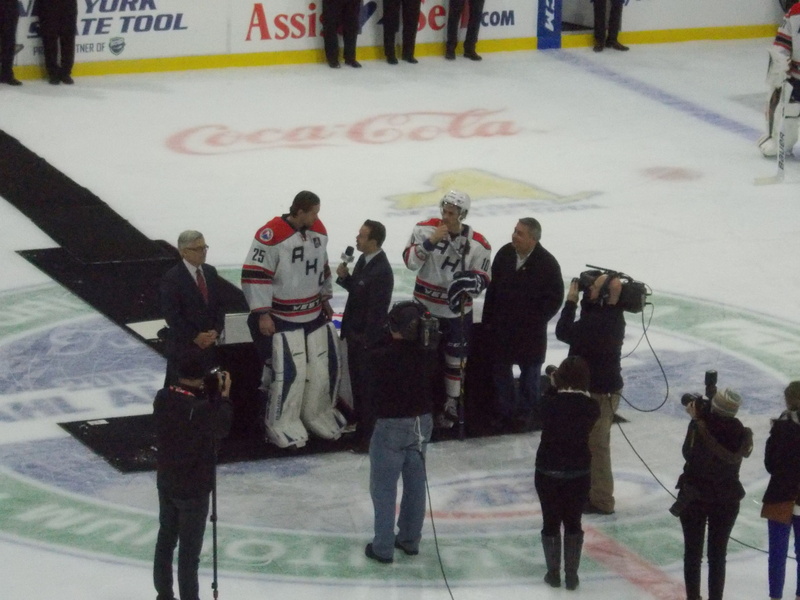 Your co-MVPs: Utica’s Jacob Markstrom and Hamilton’s Charles Hudon. Whitney finished with a goal on one shot and a -3. Thompson had one assist, two shots and a -3 rating, as both he and Whitney were on the same line (why break up a good thing?). Shinnimin lead all skaters with 10 shots on goal, he just could not get that third goal after a strong first period. The 26 combined goals were an All Star record. Thanks to the Utica Comets, the AHL, and everyone else involved for an awesome two days and a great first time experience for me! Even got in my first ever visit to Turning Stone (on Sunday night for the Post Skills party). Hopefully it’s a close location next season so I can travel there and do it again. 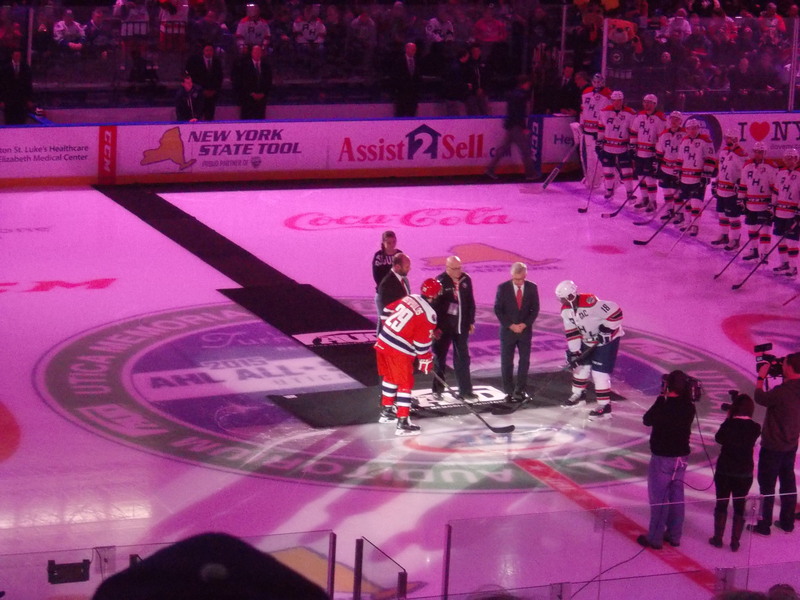 The captains and AHL president Dave Andrews with the ceremonial puck drop.